UI's newest CS faculty member Clint Jeffery wants to make Computer Science a little easier and more fun by virtue of a serious game called CVE (Collaborative Virtual Education), which looks kind of like the image below. 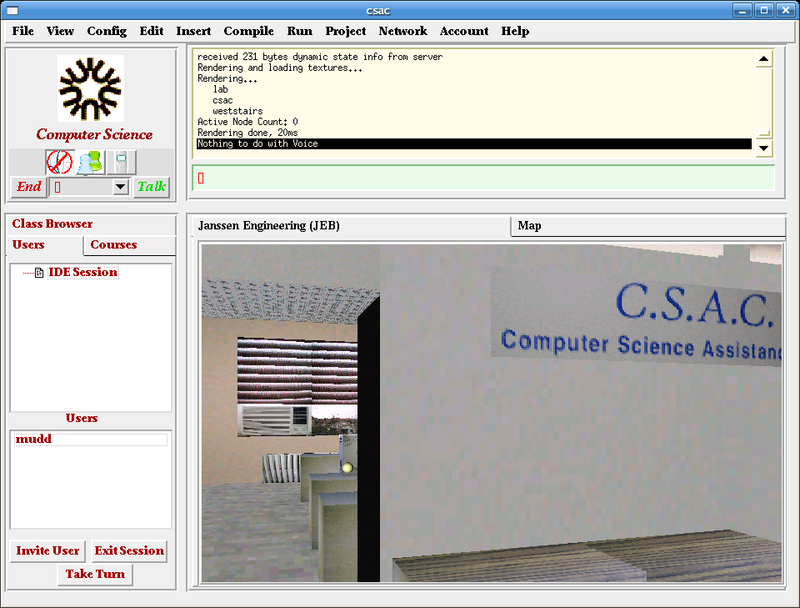 The "game" features social interactions in 3D with instructors and fellow students, along with collaborative IDE tools which will make it easier to get live on-line help. The project was built with help from the CS 404 and 428 courses on Games and Virtual Environments, which built a simple model of Janssen Engineering Building. The CVE program that Jeffery is developing is an NSF-funded open source software project which lives on cve.sourceforge.net. The Virtual UI CS Department will live at virtual.cs.uidaho.edu.